This gorgeous boy is Scott Braces, our latest 5 1/2" Braces Boy. He is made of lovely rich squirrel red German alpaca, soft and dense. We have combined this for his trousers with very dark brown, wavy, soft German mohair. This fur has a slightly longer pile than the alpaca and it makes great trousers. Scott Braces has black ribbon braces with coloured polka-dots on, dark brown ultrasuede pads and toning squirrel red ultrasuede paws. He is steel shot and steel ball filled for weight and so is nice and heavy for his size. We have given him a black stitched nose and shiny black German glass eyes. As many of you will know, our Braces Boys are very popular and Scott Braces is the only one we have available at the moment, so if he is the boy for you, don't delay for too long. He costs £45 plus postage. 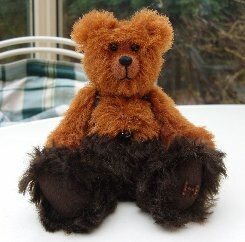 Please note that as with all our bears, Scott Braces is not a toy and is not suitable for children. Sorry - Scott Braces has been adopted.